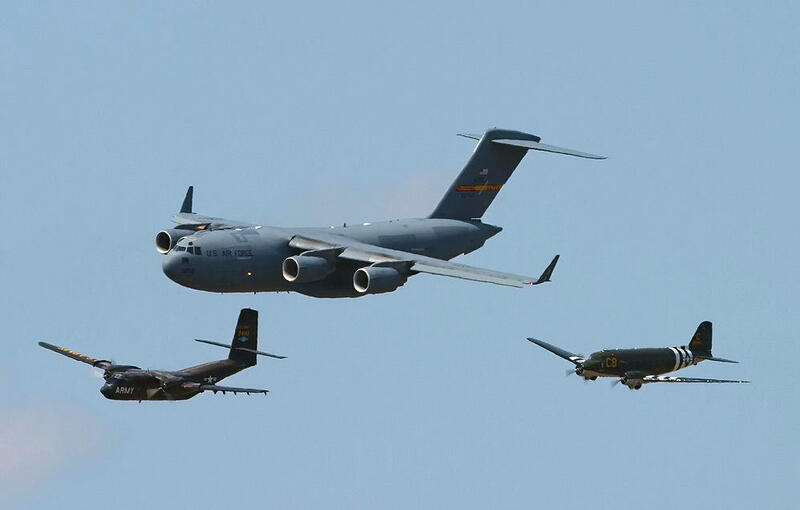 N149HF (CV-2B) and C-47 (sn 43-15935) both owned by the Cavanaugh Flight Museum in formation with a C-17 (sn 99-0058) of the 97th AMW/58th AS. at the Thunder on the River 2010 Air Show - Maxwell AFB, Montgomery - March 27, 2010. Thanks to Mike Riffle for this great photo. Caribou CV-2B, 62-4149 (c/n #85) entered U. S. Army service with the 61st Aviation Company, Major Marcus Coyle commanding, 18th Airborne Corps. at Ft. Bragg in early 1963. It participated in field exercises that spring in preparation for deployment to the Republic of South Vietnam in June as part of "Operation Highroad". On 20 June, 1963, 18 aircraft of the 61st deployed to McGuire AFB, NJ, with the actual ferry flight commencing on 22 June. U.S. Air Force C7A 1/1/67 KL-149 Transferred to USAF- assigned to the 536th Sq. Tail code "KL"
U.S. Air Force C7A UNK KA-149 Assigned to 457th Sq. Tail code "KA"
U.S. Air Force C7A 1976 AF61-149 Assigned to 150TAS/170TAG - NJ ANG Tail code "NJ"
Vanderwall Aircraft LLC. DHC-4A 7/1/99 N9249Q Sold to Vanderwall Aircraft LLC. Vanderwall Aircraft LLC. DHC-4A 8/24/99 N149HF Registered - Leased to Army Aviation Heritage Foundation. Restored to U.S. Army colors with 61st Aviation Company markings. Vanderwall Aircraft LLC. DHC-4A 7/7/05 N149HF Damaged by a tornado at Tara Field, Hampton, GA. A 2 ft by 2 ft hole in bottom of the tail, rudder and several bulkheads damaged.